Today United Arab Emirates celebrates 43rd Birthday. 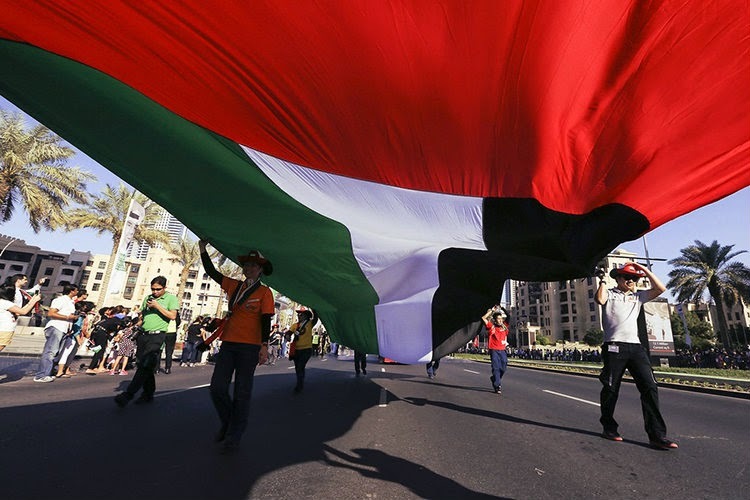 The local Arabs are very proud of their country and I can tell you that there is non of other Holiday that is celebrated as National Day in UAE. The fiesta is everywhere and there is literally no space left that wasn't decorated in UAE's colors. Live music, festivals, street manifestations and many sports and eye catching activities were running in the past four days. For my festive look I decided to dress up in colors of UAE's flag: green, red, black and white :) Hope you like it. Enjoy the fiesta if you are in Dubai! you are Always so stylish and you mix every single piece with a great sense of style! Such a fantastic look! Love your shiny top and lip clutch! 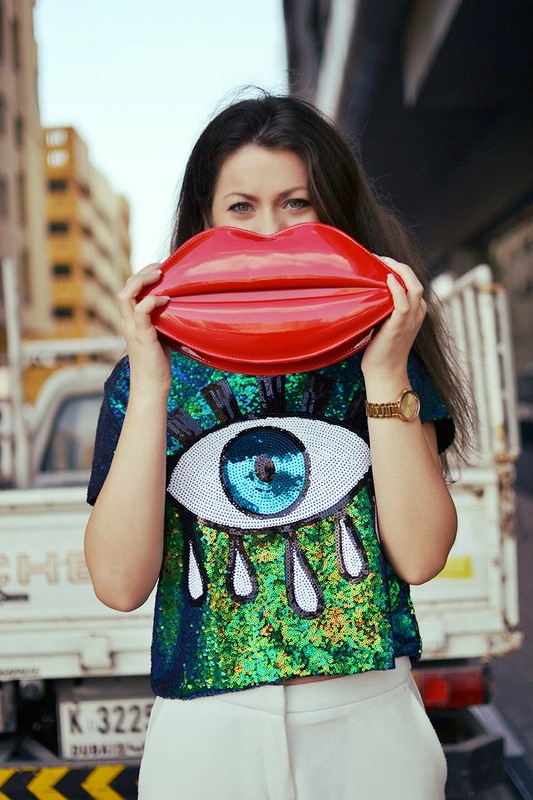 Love it the eye tee <3 and the clutch is so fun! Kisses. Great shirt and bag dear, you look great! Che carina la maglia! Bellissima anche te! Stunning clutch and top ! sei sempre troppo carina e che bella la maglia! 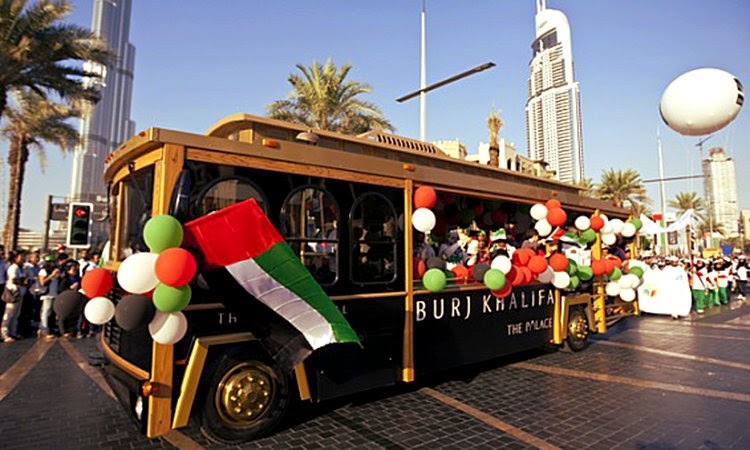 What a colorful (and stylish) way to celebrate UAE's birthday! That clutch goes perfectly with the eye print blouse. I swear these photos could be a magazine editorial! I have to admit- I know nothing about UAE history. A quick peek at Wikipedia will help with my ignorance, I'm sure. But Happy Birthday to them! That outfit is nuts! I had to smile... it's like if Picasso and Dali had a baby. I really love the pairing of the lips with the eye, in a couple of the shots, your arm seems to serve as a Picasso-style nose. so pretty, I love that blouse! Beautiful look, I always love your style dear! Awesome outfit. Love it as always. And beautiful photos. You look fantastic and I love the colors of your outfit!